Geoffrey James wrote an article on the BNET Business Network website which I think is a brilliant checklist if you are writing a sale proposal. The list is based upon a conversation he had a couple of years ago with sales proposal guru Tom Sant. Does the customer know who we are? Is the customer expecting us to bid on this? Does the executive summary address customer needs? Is the executive summary one page or less? Have we replaced all the jargon that’s meaningful only to us? Are we sure that another vendor doesn’t have the inside track? 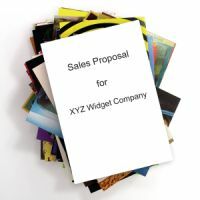 Does the proposal follow the customer’s specified format and outline? Have we removed all the meaningless marketing fluff (e.g. “state-of-the-art”)? Has someone edited out other customer names from boilerplate material? Is the writing clear and forceful rather than flat and technical? Has the proposal been edited so that it contains no glaring grammatical errors? Can the proposal convince the customer that we can actually deliver? Does the proposal define how we’ll measure customer satisfaction? Is the proposal being submitted on time and to the right people? I am also a big believer in a clear layout, proper indexing, creative packaging and good follow-up. It’s a good idea to browse through stationery and office supply stores to find different binders and covers that will make your proposal stand out. Whenever possible I use a 1/2″ 3 ring binder. Previous Post Wondering About Search Terms?